This book brings together the best thinking and practices in competitive intelligence (CI) currently being used at many of today's most successful companies. Featuring contributions from leading industry executives, it covers CI strategies across a wide range of business functions, including marketing and sales, market research and forecasting, product development, and teams. JOHN E. PRESCOTT, PhD, is Professor of Business Administration at the Joseph M. Katz Graduate School of Business, University of Pittsburgh, and Executive Editor of Competitive Intelligence Review. He is the content expert for CI benchmarking studies conducted by the American Productivity and Quality Center. STEPHEN H. MILLER is Managing Editor of Competitive Intelligence Review and Editor-in-Chief of Competitive Intelligence Magazine, published by the Society of Competitive Intelligence Professionals. Preface: Corporations Get Smart (S. Miller). 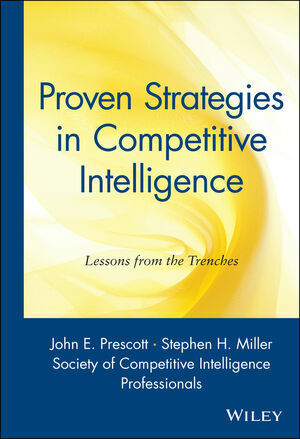 Introduction: Competitive Intelligence--Lessons from the Trenches (J. Prescott). COMPETITIVE BUSINESS INTELLIGENCE: CORPORATE CASE STUDIES. Competitive Intelligence at Procter & Gamble (J. Pepper). Shaping a Corporate Competitive Intelligence Function at IBM (L. Behnke & P. Slayton). CI and KM Convergence: A Case Study at Shell Services International (B. Breeding). Competitive Intelligence at Lexis-Nexis (H. Gieskes). CI at Avnet: A Bottom-Line Impact (J. Hovis). Competitive Intelligence at Xerox (J. Vezmar). NutraSweet Faces Competition: The Critical Role of Competitive Intelligence (R. Flynn). Competitive Intelligence at Motorola (R. Galvin). Competitive Intelligence in Business Process Engineering: A Study at Digital Equipment Corporation (L. Kennedy). Understanding the Competition: The CEO's Perspective (M. Downham, et al.). Developing a World-Class CI Program in Telecoms (S. Marceau & K. Sawka). Small but Powerful: Six Steps for Conducting Competitive Intelligence Successfully at a Medium-Sized Firm (A. Berger). Leveraging Information for Action: A Look into the Competitive and Business Intelligence Consortium Benchmarking Study (J. Prescott, et al.). Organizing the Competitive Intelligence Function: A Benchmarking Study (C. Lackman, et al.). "TAP-IN" to Strategic and Tactical Intelligence in the Sales and Marketing Functions (C. Miree & J. Prescott). Key Intelligence Topics: A Process to Identify and Define Intelligence Needs (J. Herring). Scenario Analysis and Early Warning Systems at Daimler-Benz Aerospace (F. Tessun). CTI at Applied Biosystems: Attracting, Monitoring, and Exploiting Technology-Based Opportunities (T. Budd). Benchmarking the "External Technology Watching" Process: Chevron's Experience (D. Ransley). Past, Present, and Future Directions for Technical Intelligence (W. Rosenkrans). Starting a Competitive Technical Intelligence Function: A Roundtable Discussion (P. Bryant, et al.). Appendix: CI-Focused Organizations Referred to in This Book.